Kubernetes is a cloud-native open-source system for deployment, scaling, and management of containerized applications. It provides clustering and file system abstractions that allows the execution of containerised workloads across different cloud platforms and on-premises installations. The built-in support for Kubernetes provided by Nextflow streamlines the execution of containerised workflows in Kubernetes clusters. This is an experimental feature and it may change in a future release. It requires Nextflow version 0.28.0 or later. Kubernetes main abstraction is the pod . A pod defines the (desired) state of one or more containers i.e. required computing resources, storage, network configuration. Kubernetes abstracts also the storage provisioning through the definition of one more more persistent volumes that allow containers to access to the underlying storage systems in a transparent and portable manner. 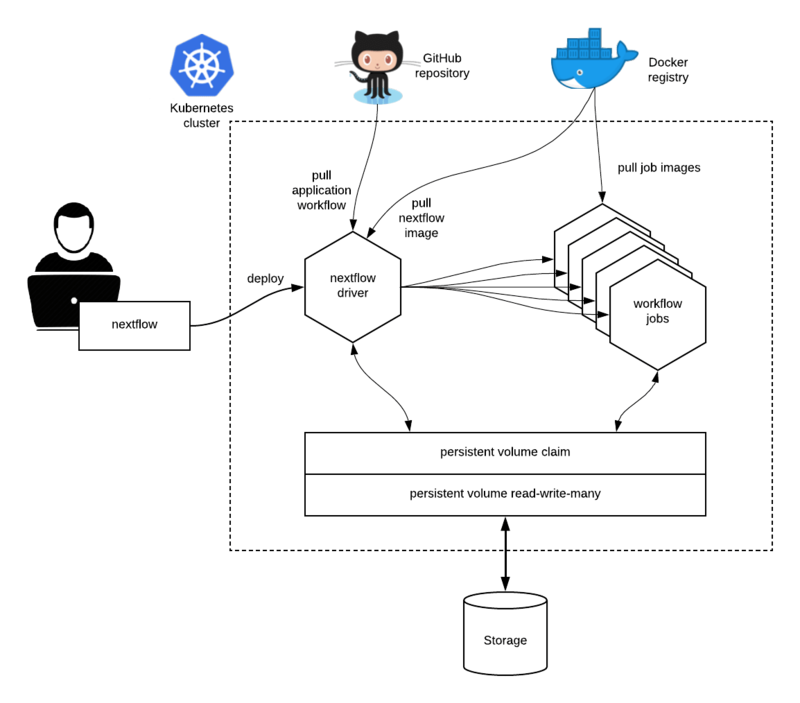 When using the k8s executor Nextflow deploys the workflow execution as a Kubernetes pod. This pod orchestrates the workflow execution and submits a separate pod execution for each job that need to be carried out by the workflow application. At least a Persistent Volume with ReadWriteMany access mode has to be defined in the Kubernetes cluster (check the supported storage systems at this link). Such volume needs to be accessible through a Persistent Volume Claim, which will be used by Nextflow to run the application and store the scratch data and the pipeline final result. The workflow application has to be containerised using the usual Nextflow container directive. The workflow execution needs to be submitted from a computer able to connect to the Kubernetes cluster. Nextflow uses the Kubernetes configuration file available at the path $HOME/.kube/config or the file specified by the environment variable KUBECONFIG. This command will create and execute a pod running the nextflow orchestrator for the specified workflow. In the above example replace <pipeline-name> with an existing nextflow project or the absolute path of a workflow already deployed in the Kubernetes cluster. The -v command line option is required to specify the volume claim name and mount path to use for the workflow execution. In the above example replace vol-claim with the name of an existing persistent volume claim and /mount/path with the path where the volume is required to be mount in the container. Volume claims can also be specified in the Nextflow configuration file, see the Kubernetes configuration section for details. Once the pod execution starts, the application in the foreground prints the console output produced by the running workflow pod. This command creates a pod, sets up the volume claim(s), configures the Nextflow environment and finally launches a Bash login session. The pod is automatically destroyed once the shell session terminates. Do not use to start long running workflow executions in background. The main convenience of the kuberun command is that it spares the user from manually creating a pod from where the main Nextflow application is launched. In this scenario, the user environment is not containerised. In the above snippet replace vol-claim with the name of an existing persistent volume claim and replace /mount/path with the actual desired mount path (default: /workspace) and storageSubPath with the directory in the volume to be mounted (default: /). The running pod must have been created with the same persistent volume claim name and mount as the one specified in your Nextflow configuration file. Note also that the run command does not support the -v option. The process pod directive allows the definition of pods specific settings, such as environment variables, secrets and config maps when using the Kubernetes executor. See the pod directive for more details. Currently, the kuberun command does not allow the execution of local Nextflow scripts. Read Kubernetes configuration and executor sections to learn more about advanced configuration options.